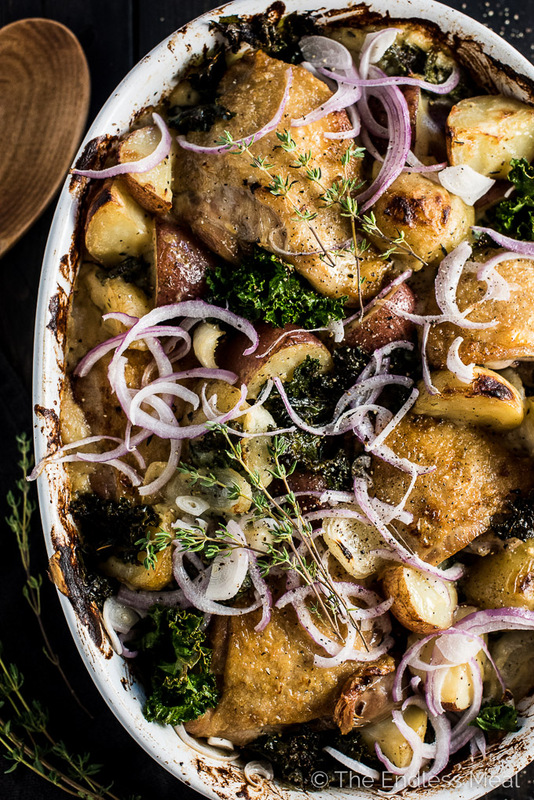 Healthy One Pan Chicken Potato Gratin is a remake of the famous classic. We've snuck in extra veggies by replacing the traditional butter and flour heavy sauce for a rich and cheesy cauliflower sauce, then nestled in some crispy skinned chicken and kale for a delicious and easy to make dinner recipe. 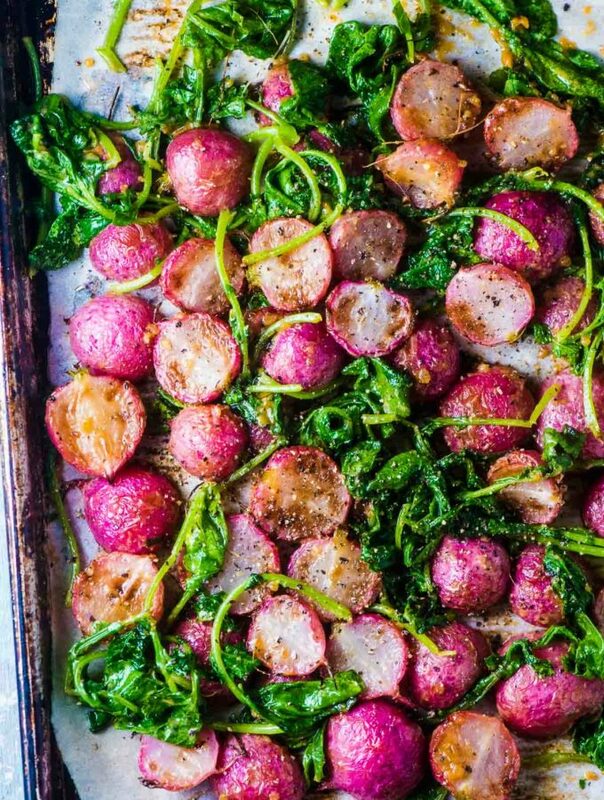 I've got a one pan dinner recipe for you today because it's October, it's getting chilly, and easy comfort food is where it's at. This is all about feel-good potatoes, crispy-skinned chicken, and the creamiest cheese sauce ever. It's everything your wildest, cheese sauce filled fantasies are made of. Only it's not quite. You should know me better than that. There's no butter, no flour, no cream, and only a handful of cheese in here. 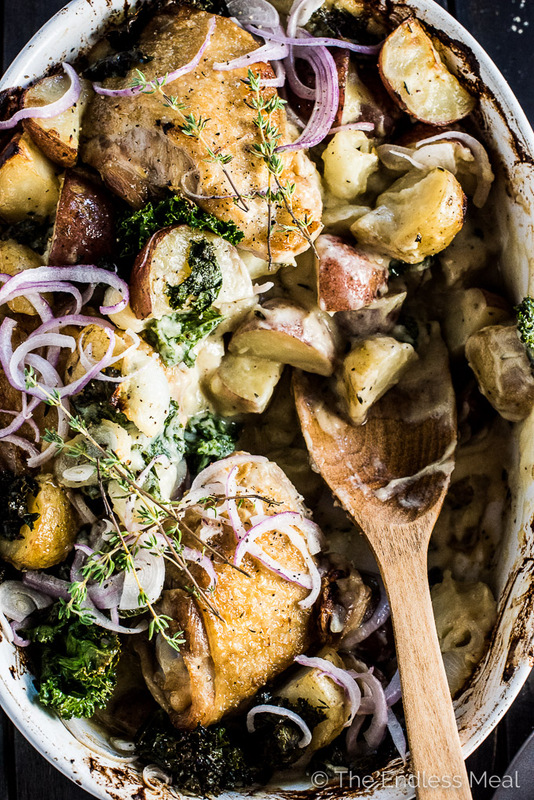 I pinky swear promise that you won't notice that this is a HEALTHY chicken potato gratin recipe. ? I went back to that much loved Vegan Cauliflower Alfredo recipe and gave it a bit of a non-vegan tweak. Spoiler alert: I added cheese. Then I baked some potatoes, nestled in some chicken, and poured that cheesy cauliflower sauce all over so it wound itself around all the potatoes. Because we all know that cheese + potatoes + awesome. 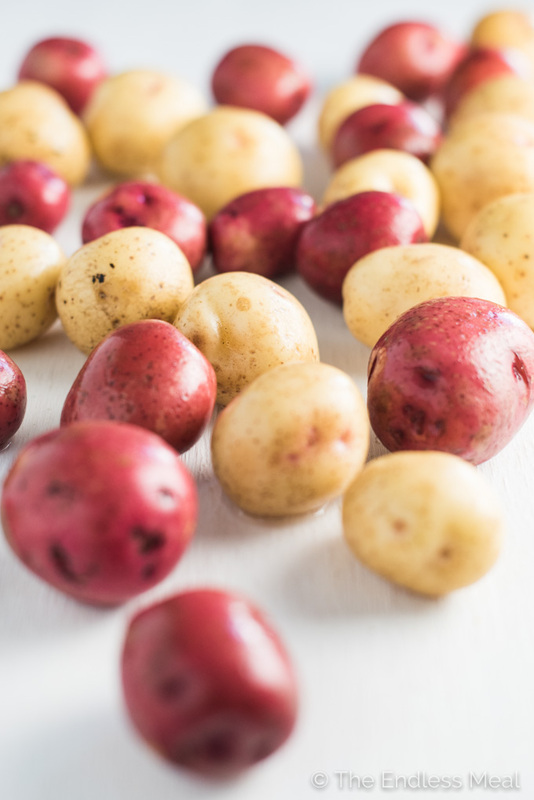 Rub some oil on the potatoes and pop them in the oven. Steam some cauliflower and add it to your blender. Stir in a handful (or two) of cheddar cheese. Sear the chicken till the skin is crispy and delicious. 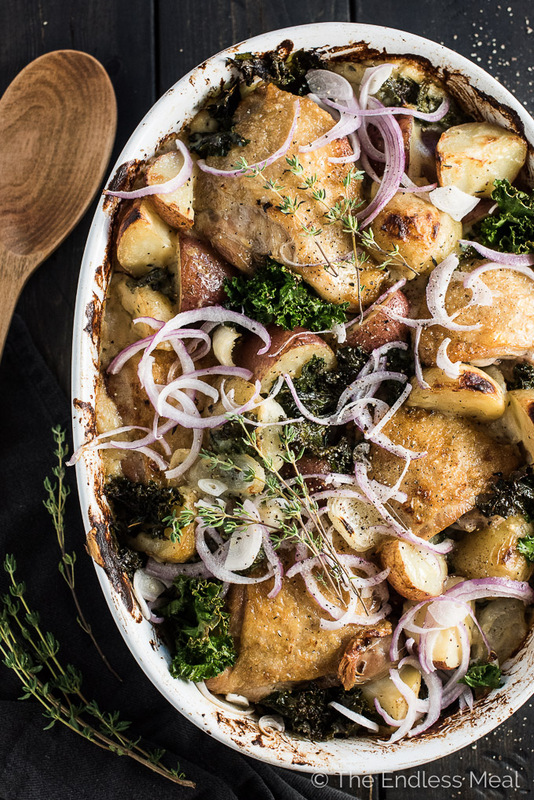 Nestle the chicken into the potatoes, pour over the cheese sauce and dot the pan with kale. 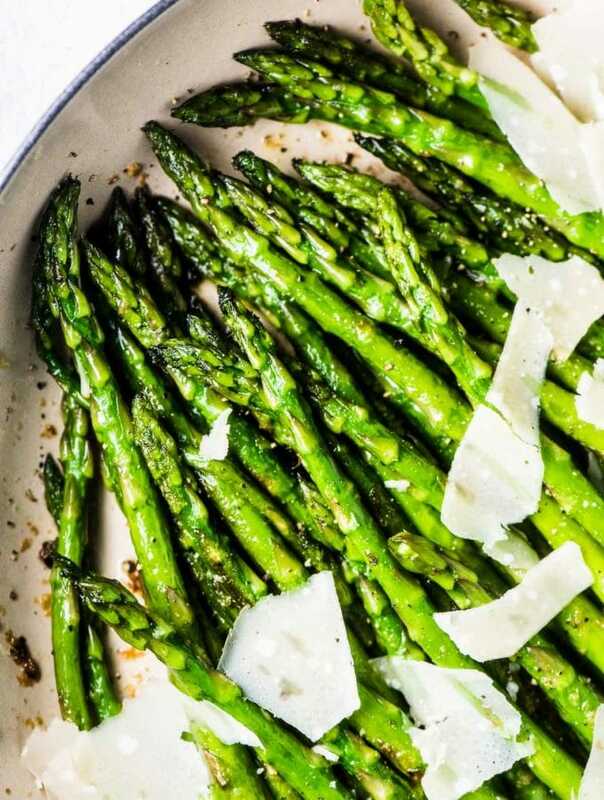 Cook a little longer, then EAT! 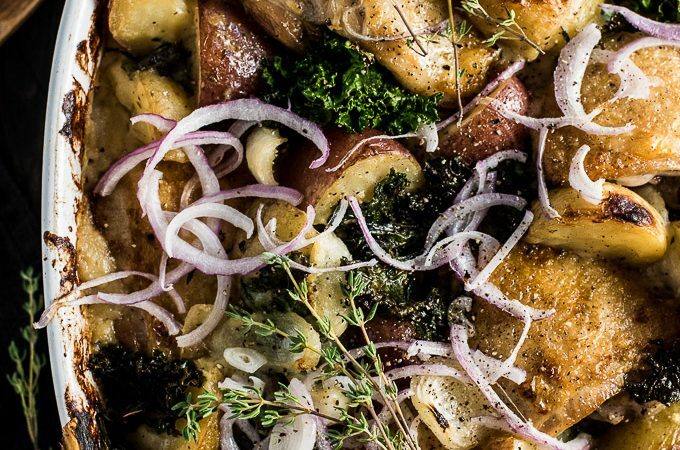 If you make this One Pan Chicken Potato Gratin makes sure you snap a pic and tag #theendlessmeal on Instagram so I can like and comment on your photos. 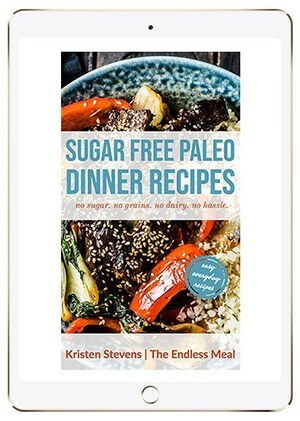 I love seeing TEM recipes you create! There should be chicken in the ingredient list? Well that’s embarrassing! It’s in there now. Thank you for pointing that out!